In my previous blog I used geospatial functions ST_Xmin() and ST_XMax() in SAP HANA (using free Express edition) to get Europe’s most West and most East points’ longitude. But what if I want to find exact coordinates, including latitude, of these specific locations making extreme points of the European continent? Here is my approach, but please share yours if different. In that previous blog I used ST_Envelope() function to return the bounding rectangle for the shape of the Europe. 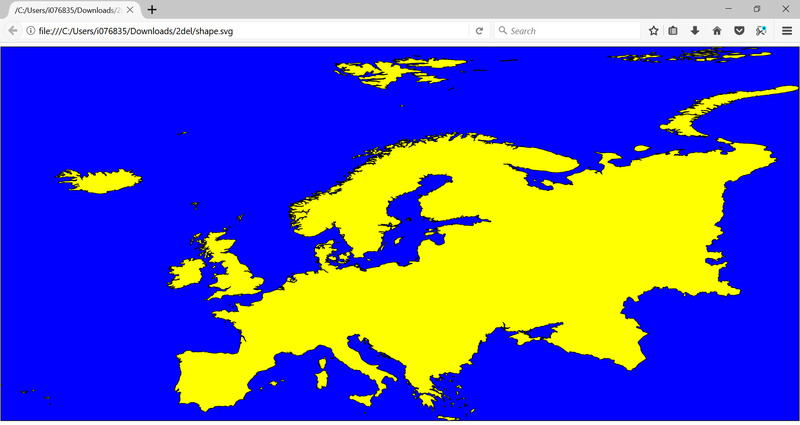 If I would combine them together on the single picture [using an export to SVG and rendering in the web browser], then the result would be like this with “envelope” shape in blue and the continent’s shape in yellow. Locations were boundaries of these two geometries touch each other would be our extreme points! The geospatial function ST_Intersection() should come handy in this case, as it returns the geometry representing the point set intersection of two geometries. In our case we need to remember that we are interested only in the intersection of the rectangle’s boundary, while ST_Envelope() returns a polygon [the whole blue area underneath the shape of Europe on the picture before]. So, I need to get boundary using geospatial function ST_Boundary() as the name suggests. So, once again, to read the query properly: I take the shape of European continent (with islands), then take a boundary of the rectangle around it, and check the intersection points of that rectangle with the shape of the continent itself. And the result is the collection of four points with their decimal latitudes and longitudes! Let me add them in red to SVG picture to visualize the complete picture. Not all of these calculated extreme points are exactly the points as described in the Wikipedia article mentioned at the beginning of this blog, but then – as I have mentioned in the previous posts – the quality of the output reflects the quality of the input, i.e. the open data maps I have uploaded to my HANA instance. PS. Are you attending SAP TechEd in Barcelona in November? Stop by AppSpace in the Developers Garage at the show floor to say Hi and to try some of SAP HANA hands-on exercises: with predictive analytics and native development in XSA.